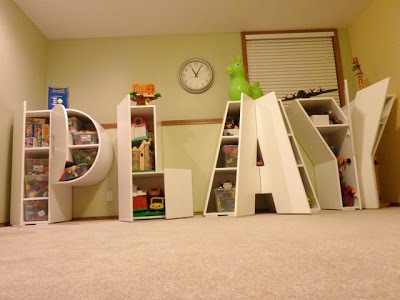 So now I have started the fun of looking up playroom ideas. I am in constant awe of the creativity of fellow Moms (and Dads). They have come up with the unique ideas that I am not even sure I am skilled enough to recreate (thankfully my parents are though, just kidding Mom, well kind of kidding…). 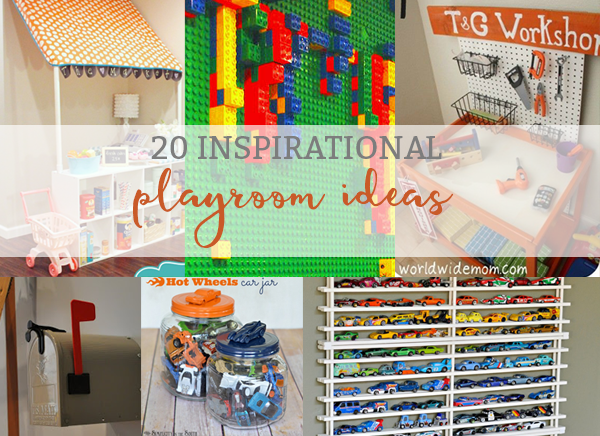 So today I am sharing with you 20 playroom ideas that have inspired me. 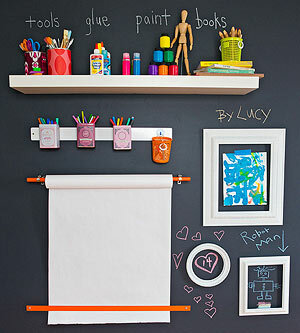 The best part is, these ideas can be used in kid’s rooms and classrooms, too! Here are the ideas I have major mom envy over. This is such a sweet idea. My kids love to see what’s in our mailbox each day. It would be so much fun to leave them their own little pieces of mail to open. In addition to every day fun, I this could be a lot of fun during the holidays as well (letters from Santa, Elf, Easter Bunny, etc). 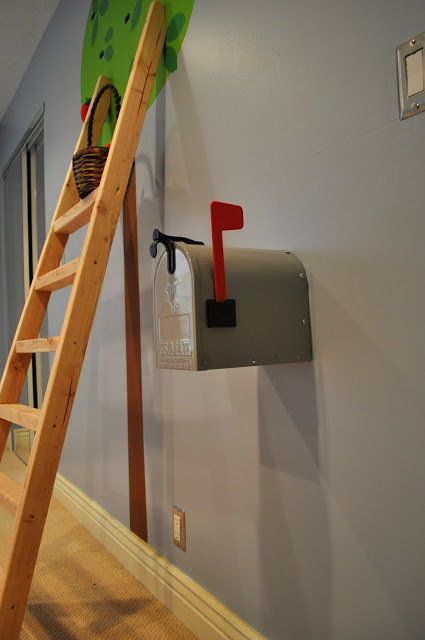 This mailbox on Amazon is made of plastic which would be perfect to use in a playroom. Seriously, could the tiny little stage set up be any cuter? I already have the Expedit shelves so this is definitely in the running (but I will probably wait until the kids are a little older, right now they’d use them for hiding). 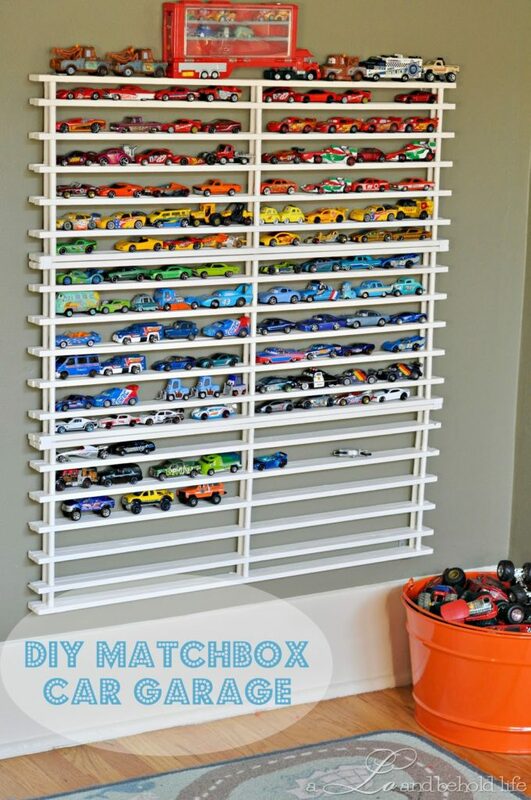 I love this idea for any small storage. It’s such a simple and easy way to organize small toys. Like most boy-moms, we have a small fleet of vehicles. 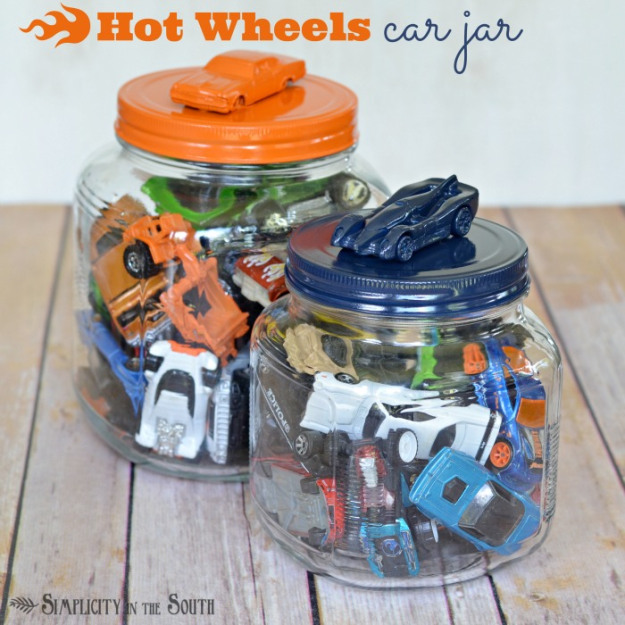 This would be a great way to recycle old jars. If you don’t have any larger jars, these from Amazon would work perfectly. 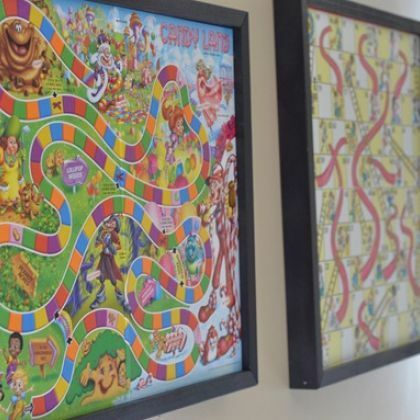 What child wouldn’t want to have their art on display in such a fancy way? It definitely has one up on the fridge. Amazon has this set of 6 empty black frames that would make this project easy to recreate. You could spray paint the frames a fun color to go with your playroom theme. 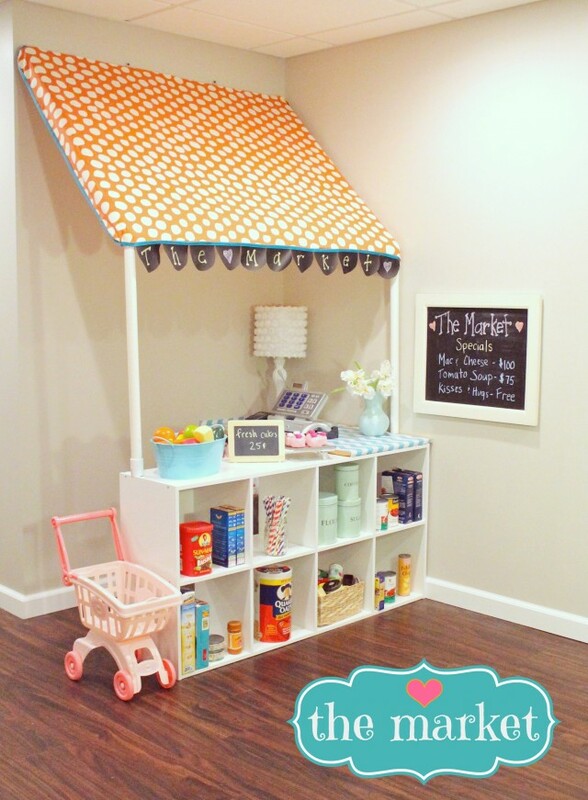 I love when people add an awning to their playrooms. It looks so cozy. This is one of my favorite examples. If you aren’t the sewing type, Amazon sells a few including this adorable one. It’s on the smaller side (two feet wide) but would be perfect to create a pretend little shop or to put above a play window. I pinned this when I was first pregnant with Carl. 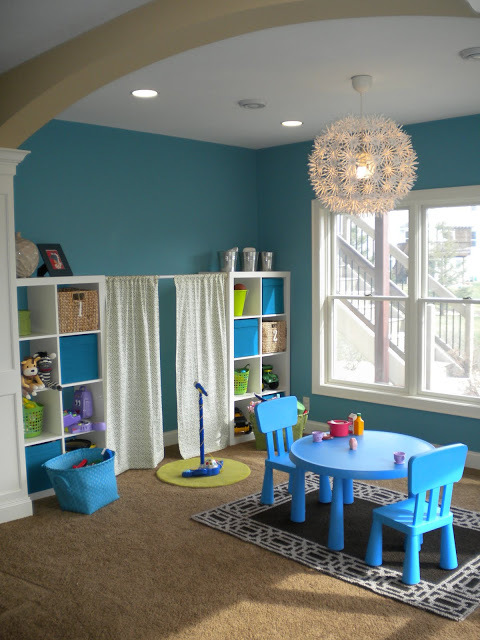 Small little nooks like this are perfect to encourage children to sit and read. I would have loved to have my own little reading nook as a child. Amazon has these shelves that would allow you to create this look. Just buy three in your preferred color (I love the weathered look). Finding a cushion to match this bench was difficult. Most I found were expensive and/or not the right length. Making your own (or asking a loving Grandma to make it for their grandchild) may be your best option. 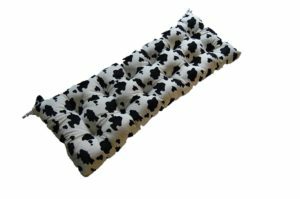 Plowhearth has two 57 in long cushions that could work in green/blue colors (as of March 2017). Now, I did find this next adorable cushion that is tempting despite it’s price. We are considering a farm themed Playroom so that we can have animals and of course, many tractors. 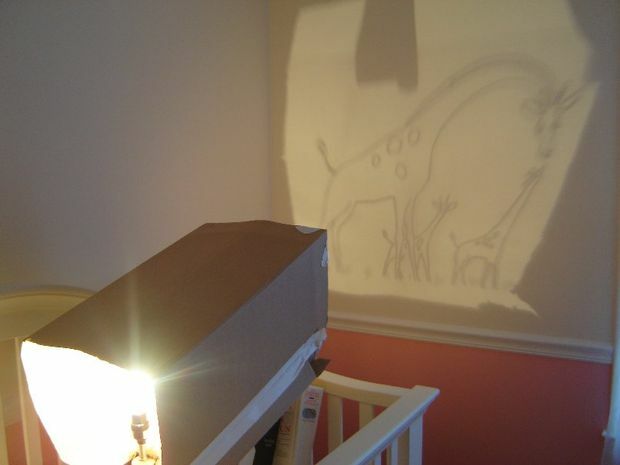 This would definitely keep the playroom fun and whimsical. This is another perfect way to utilize this bookshelf from Amazon or the Expedit/Kallax bookshelves from Ikea. 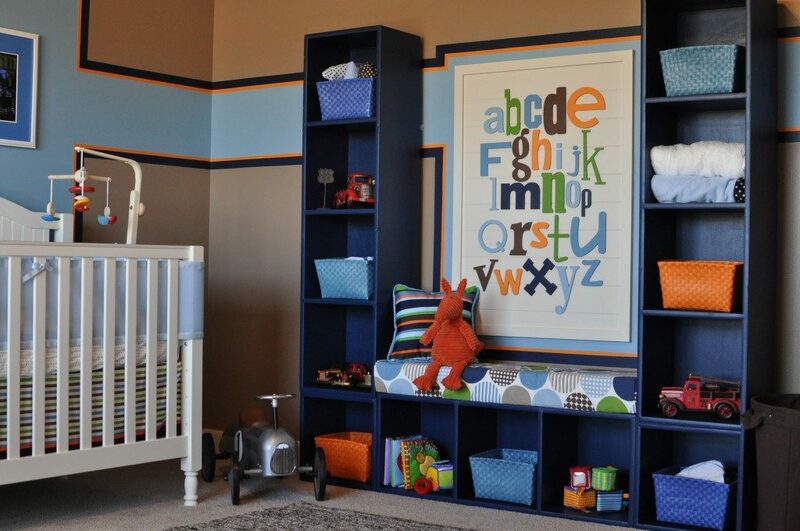 Again, this provides a nice area for your child to read while providing storage at the same time. I have to admit, we’re never going to be crafty enough to make these. But I just had to share them. All you need is a magnetic knife holder like this one from Amazon. 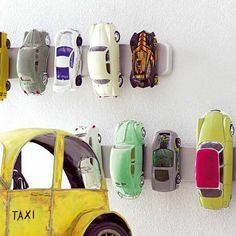 This is another wonderful way to store small cars. It looks like they may have done away with their post on how to make this and instead have a link to purchase it (great for those of us that aren’t so handy). I remember they made it by using shoe racks like these. They turned them on their side, painted them, attached one on top the other to make the shelves deeper, and then hung them. Maybe I will try to make one for the boys and will share a DIY with you all. 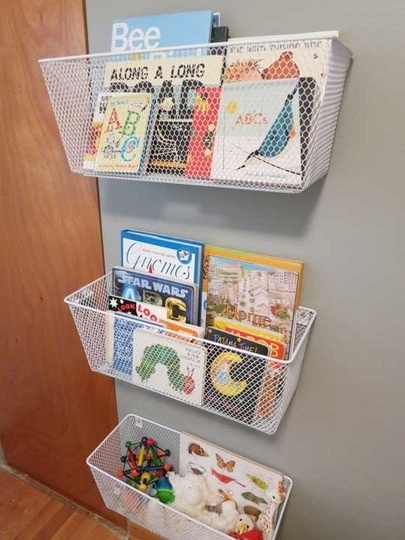 This is a simple way to store books and small toys in a playroom or kid’s room. Can you tell we have a lot of books in our house? I love anything that excites a child about reading. Having the books on display in a manner that allows the child to easily interact with the books will encourage a love of reading. Books are meant to be touched, loved, and held by little hands. This system also allows you to put important books up higher (like maybe older books that you read as a child). 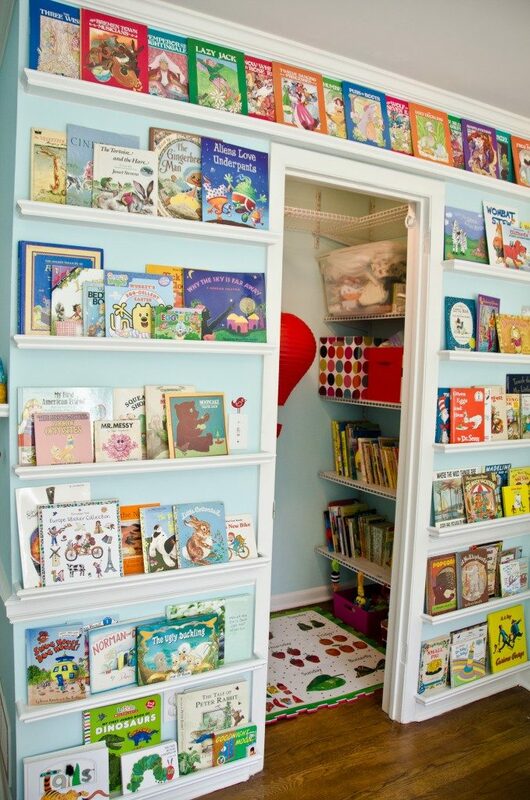 Then you can keep more baby-friendly books down lower (like board books). No need to borrow or purchase an old overhead projector. This looks easy enough that maybe even I could do it! I couldn’t pick just one thing. 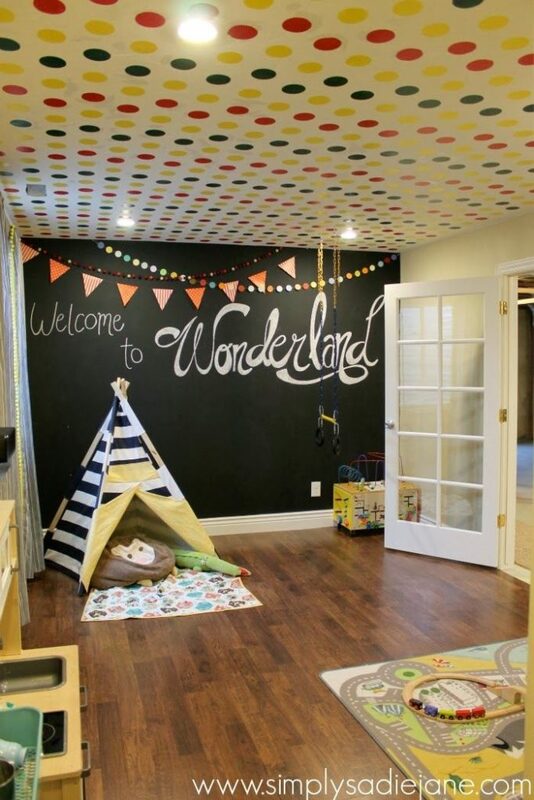 The tepee, the polka dot ceiling, the chalkboard wall! I love it all. This tepee from Amazon would be the perfect addition to any playroom. I mean – come on. 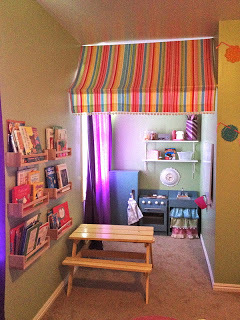 How can some PVC, fabric, and a little bookcase turn into something so adorable? This image has become so popular for a reason, it’s amazing. Unfortunately, my boys are too little to use this one yet. Lego pieces are just to small for little ones. 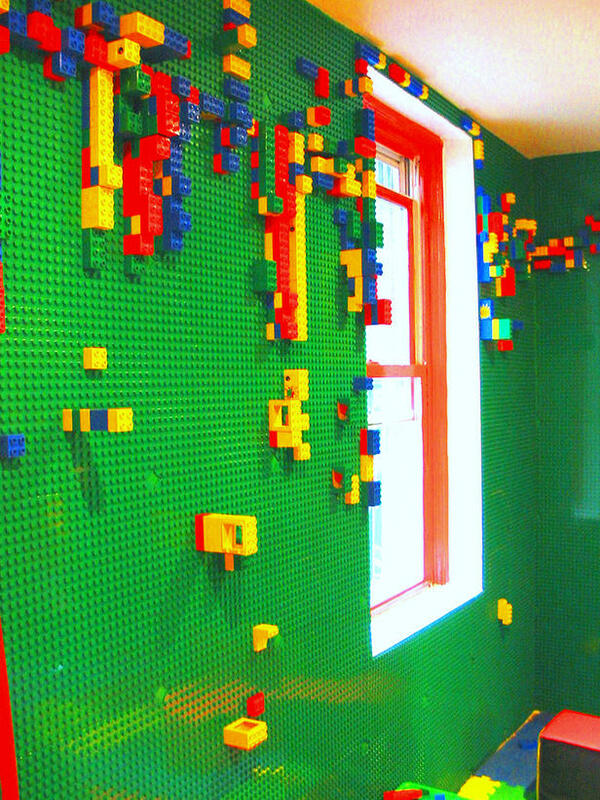 This peel and stick building mat four-pack would help create this wall (and is compatible with Legos). These base plates could work, too, (with some 3m velcro hanging tape – I love this stuff). Again, whoever was this creative to think of this? This is such a smart idea. The boys would love to pretend he’s just like Daddy. I love the addition of the peg board, it makes it seem much more authentic. 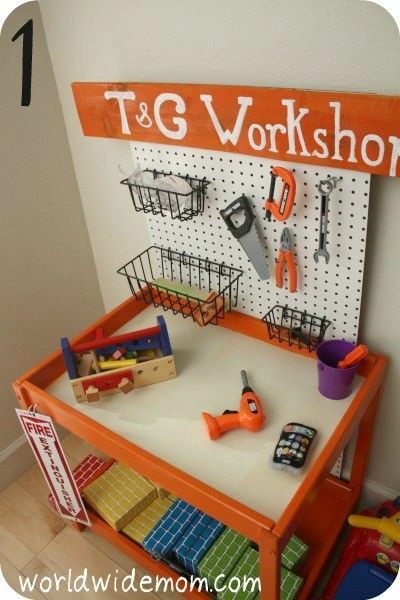 I also like that the piece could be used later on when they outgrow it (pegboard and baskets would be cute behind a desk for a child, and the table underneath could definitely be reused). Do you have a budding artist? This art wall would inspire creativity. This preschool is adorable. 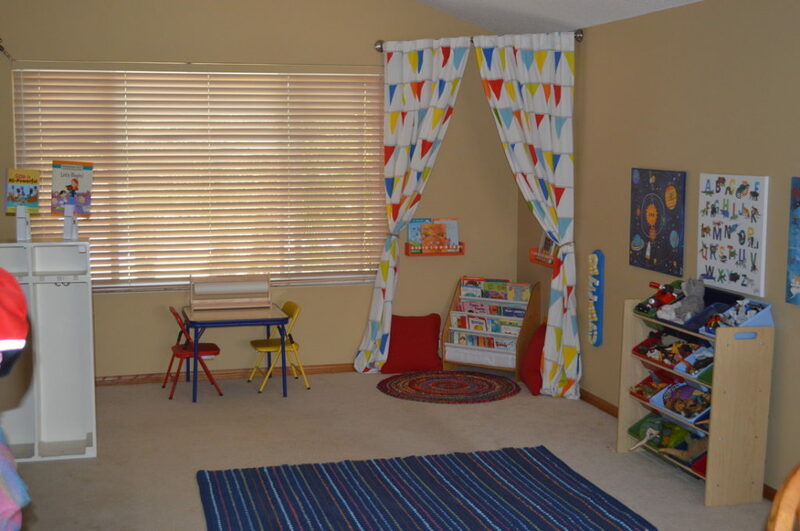 My favorite item in the room is the curtain rod in the corner creating a book nook. Again, this is another way to encourage a love of reading. What child wouldn’t want to crawl up with a book in that corner. It would be especially fun to turn out the lights, close the curtains, and do some flashlight reading. This curved shower rod could make this possible. P.S. You should go check out my latest post (And The Award Goes To…)! I think you'll be surprised! pinned all of them…maybe one day I will finally have a house and my kids will get a nice room.